Have you ever met pixies? Grab the opportunity to do so on Pixie Wings Slot at Wicked Jackpots! Brought to you by Pragmatic Play, it is made up of 5 reels and 50 paylines. It comes with a background showing hazy woodlands, while the reels are set in a dark red colour. The various symbols you can see are Yellow, Blue, Purple and Green Pixies, along with card symbols like 10, J, Q, K and A. Try this magical game on a mobile phone, computer or tablet at Wicked Jackpots! Enjoy Pixie Wings Slot by toggling the + and – buttons on the Coin Value field to adjust your stake. When it is done, click on the Spin button to start the game. Also, use the Auto Play option to launch 10, 20, 30, 50, 70 or 100 spins that are played hands-free. You can also personalise your game with the Turbo Spin or Quick Spin options. Bet Levels: Select 1 to 10 coins for each line. Amount of Paylines Selection: All the 50 paylines are fixed and it is not possible to adjust them. Coin Values: Place your bet using the following coin denominators: 0.01, 0.03, 0.05, 0.10, 0.20 and 0.50. The Tree on Pixie Wings Slot is the Bonus icon, which is the key to the Free Games feature. Plus, you are offered a random selection of 3 to 12 free spins, together with any of the Pixie or Wild symbols being stacked. On Pixie Wings Slot, the Pixie Wings Logo is Wild and replaces any symbol, except Bonus. It is also randomly chosen to be a Mystery Stacked Symbol. 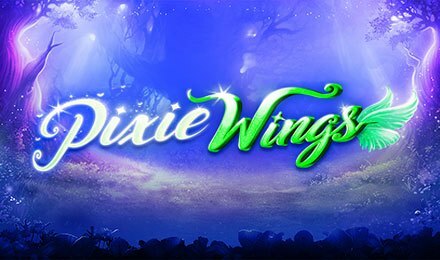 Enjoy the company of pixies while you launch Pixie Wings Slot at Wicked Jackpots. Wishing you good luck!